The buildings that make up 119-123 Upper Spon Street and 1 Barras Lane continued to be used as shops and homes until the late 1970s or early 80s, after which they were condemned as not fit for habitation. They were then gradually bought by the council who left them empty and crumbling away. 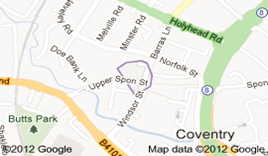 Coventry Council did consider plans to dismantle them and rebuild them as part of medieval Spon Street. However the Spon Street scheme seemed to run out of steam (or money) before they got to these. Just as well, as this would have destroyed a large proportion of the fabric of the building and they would have lost the association with where they belong. By the 1990s the common consensus was that these buildings were an eyesore and in far too bad a state to do anything with other than tear them down. In 1993 Nick Holdsworth (a journalist with the Evening Telegraph) and Malcolm Adkins (a lecturer at Coventry University and local resident) talked in the pub and agreed that 119-123 Upper Spon Street should be restored. Nick’s father was an architect and suggested we form a building preservation trust and approach the Architectural Heritage Fund. This was done and the first trustees were drawn from local residents groups who were very active at the time. The City Council were persuaded to allow the Trust to work on the restoration of the buildings and (at the appropriate time) to grant a long lease. As the freeholder the council did have a duty to maintain this Grade 2 listed building and the Trust offered them a relatively cheap way of doing it. The Architectural Heritage Fund gave a small grant to commission a feasibility study and for administration. It soon became clear that a critical issue was finding a viable end-use for the buildings. This meant producing a business plan. Many building preservation trusts work on the basis of selling the building when they have finished and moving on to a new one. That was not thought appropriate in this area. Potential funders also demanded that the Trust produce a conservation plan explaining its policies regarding the conservation of each part of the building. The first task was to stop the buildings falling down and the trustees secured funding from the City Council and English Heritage to treat the dry rot and to erect scaffolding to support the structure and keep out the rain. At first the trustees thought that they could restore the terrace in one go and went to the newly formed Heritage Lottery Fund for support. They were told that they were too inexperienced to take on such a big job. Phase 2 of the project was to restore the double unit on the corner (No. 123) and the buildings behind it in Barras Lane. We have created 11 offices which are let to community organisations and small businesses. Just under £400,000 was raised for this phase from Europe, the City Council and English Heritage. This was completed in 2002. This is the part of the terrace which has relatively little medieval structure and so the conservation issues were not so critical. However, examples of medieval lath and daub were preserved behind glass in one of the rooms and a medieval well was found in another. Because of the discoveries made in Phase 2, we were able to go back to the Heritage Lottery fund (and other funders) and submit a bid for phase 3 to restore the other 4 cottages and court 34 and to create a new building on the site of court 33. This £1.4m project was completed at the end of 2007.